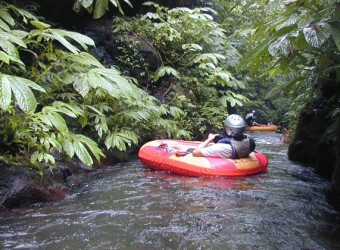 Bali Activity An exciting Canyon Tubing Adventure, drift down in the inflatable tube through the hidden canyon and unspoiled nature on Siap Stream in the north of Payangan where you can discover so many different species of animals and plants grow down the canyon. 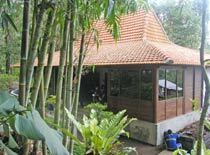 Shorts or Swimming Suit, Sport or River Shoes/Sandals (no heels), a Pair of Extra Clothes, Sun Screen are Recommended. 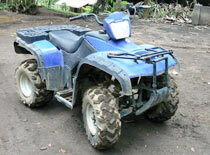 For tandem a child 6 - 10 years old can join the activity with an adult. 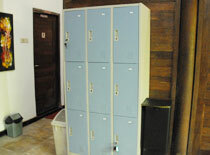 ・Keep your valuables in the individual locker. 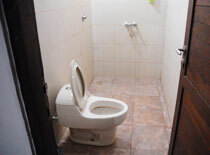 ※Neither the rest room nor the moisture replenishment can be done until returning to the restaurant. 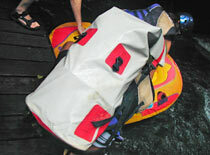 ・Keep your valuables in the water-resistant bag. 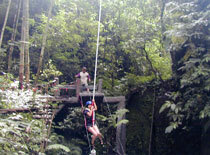 ・You can also join on other exciting activities(Flying Fox and Tarzan Jump)during Canyon Tubing. ・It is about 700m from stream to the road. 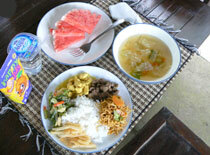 ・Indonesian Lunch includes mineral water and juice. ・Free use of shower and towel. Body soap is not available. * Pick up time is subject to change. 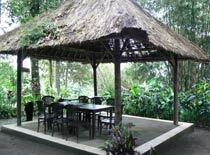 * These price is applicable with booking 2 persons. 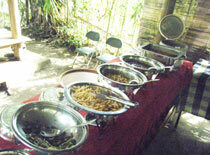 For 1 persons guest needs Additional charge ＄15 required. 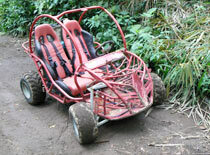 * For buggy, The child person who age 5～15 have to ride with adult person. For tubing, Child person who age 5～10 have to ride with adult person and the person who age 11～15 can ride themselves. Get off the car and descent the canyon. Descent the Canyon to Siap Stream. 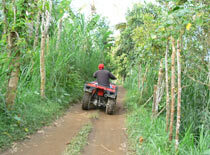 You can find untouched flora & fauna. Water-resistant bags for your valuables are available. What kinds of clothes should I wear? Please wear clothes you can get wet. Putting on swimwear under a T-shirt and short-pants are common. 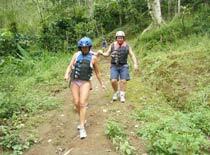 Sandals with straps are recommended walking up and down on the mountain street and the stairs. Cameras and videos which are not waterproofed are not allowed to bring by the agency. Can people who are not physically active join the tubing? Tubing does not required energy. 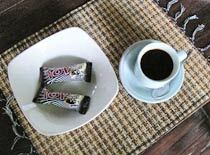 You will be walking about 10 minutes, but you can walk with your own pace. Does the activity get canceled when it rains? You can still enjoy tubing in the rain, so it won’t normally get canceled. It Was a Fun Adventure! 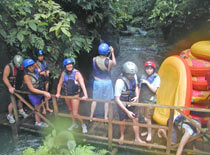 I joined rafting when I came to Bali last time. 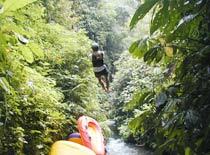 I thought I wanted to enjoy more deeply the joy of jungle tourism, that’s why I challenged canyon tubing. 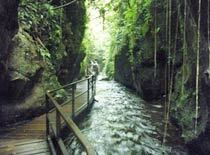 The river when I joined rafting was wide and calm, but nature along Siap River for Canyon Tubing is still dense,. 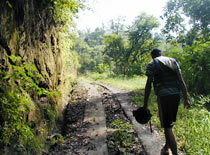 It is really untouched dense forest. I thought that I would not get so tired because no owing oar, however there was attraction of tarzan rope, carrying the boat at turning point and others. It made my arms felt pretty tired.